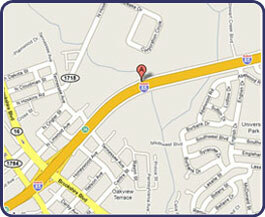 Fleetco Trailer Sales is located in Charlotte, NC. at 801 Carrier Drive. We can easily supply trailers to the following cities within 24 hours! Merge onto I-85S. Take exit 37 Beatties Ford Rd. Turn left at the light. Turn left at the next light onto Hoskins Ave. Turn Left on Carrier Dr. Fleetco is loacted on your right about 1 mile down. Merge onto I-85N. Take exit 37 Beatties Ford Rd. Turn left on Beatties Ford Rd. Turn left at second light onto Hoskins Ave. Turn left onto Carrier Dr. Fleetco is located on your right about 1 mile down.